Before School: 7 – 8:40 a.m.
After School: 3:15 – 6 p.m.
Our staff get to know and work with you to provide a successful and quality experience for your child. We employ well-trained and enthusiastic people who enjoy and understand young children. Our child care program provides an environment where your children are safe and well cared for while you are at work, and where they are able to enjoy fun, creative, and stimulating activities. 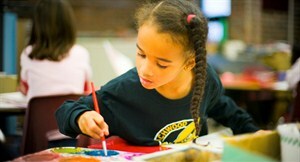 Our professional staff are very experienced in working and teaching children. Because children in the Childcare Program have a very long school day, before and after care activities are enjoyable, as well as educational, and our staff specialists in music, art, cooking, science, dance and fitness enrich the daily program.